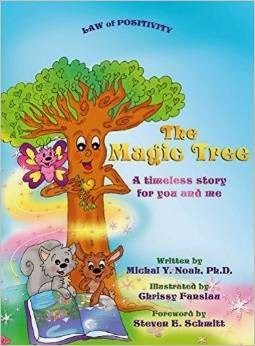 The story of "The Magic Tree" by Michal Y. Noah, PhD is written in the form of a poem, providing a gentle manner for children to receive some powerful life lessons. Illustrated with beautiful, gentle, happy artwork helps to make the message of the story come alive. Through the story, children learn that everyone has their own unique role and contribution to offer the world. Everyone is important, even though we are all different. Through our daily life, days turn into nights, seasons come and go and with the passage of time, the important people and friends in our lives come and go too. This special little book enables children to learn to appreciate nature, friends and seasons. Children learn that by understanding what we have to contribute they develop a healthy self-esteem and tools to withstand the storms or the difficulties in life. A powerful message presented in a beautiful format. This book is of benefit for children to read on their own or for parents, teachers and therapists to use as a platform to help children to develop these skills in their own lives too. occupational therapist and co-author of "Tuvia Finds His Freedom"